CloudCheckr's Advanced Grouping report is a powerful tool that gives you total flexibility over the cost data in your Amazon Detailed Billing Report (DBR). Advanced Grouping allows you to easily pivot your data and costs by multiple levels of DBR criteria, such as Account, Resource ID, Service, and Tag Keys. For instance, you can group costs by Tag Keys of CustomerName, then further group costs within that by Tag Keys of ProductName. 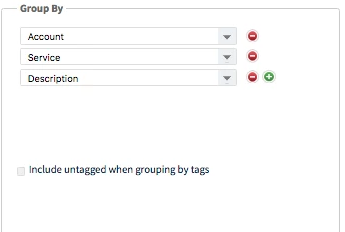 You can create reports of up to five levels of groupings with Tag Keys. As mentioned above, Advanced Grouping reporting is based on data from the Amazon DBR—the best source of cost data for your account because it shows all your resources in the most amount of detail. Your DBR gets written into a file on stored in an S3 bucket, with the complete details of your AWS charges, credits, and net bill. AWS pushes updates to your DBR about every 4-6 hours, and CloudCheckr checks hourly to see if any new data is present. As soon as new data is found, we will make it available to you. You can see the latest update time by clicking on the Billing Data Checked button on your header bar. At the turn of the month, AWS continually modifies that final few hours of the month. The effect of this is that a month will not get finalized until a few days into the next billing month. For more information, review the Monthly Rollover topic. You can also get visibility into your costs via CloudWatch data, but this is much less detailed and less frequently updated that the DBR and does not include information on tags. The Group By section is where you begin the organization of your search. You can select up to five levels of groupings for your data. For example, you can group by account, service, and description to see a breakdown that has description data direct from your billing data. Resource Key: the tag key used when tagging your AWS resources. Account: the AWS account(s) where the costs are occurring. If you are using Consolidated Billing within AWS, all linked accounts will display. Region: the AWS region(s) where the costs are occurring. AWS Service: the AWS service such as EC2, S3, RDS, etc. In the DBR, transfer fees are included in the service where the data transfer occurred, whereas CloudWatch treats Data Transfer as its own service. Operation: the specific usage within AWS. Such as 'RunInstances' (the operation of an Amazon EC2 instance). Usage Type: specifies usage details for the operation, such as 'CW-Requests' for CloudWatch requests. Description: the type of usage for this line item. This description matches the description in the Account Activity page, including the average price of any usage that is based on a volume pricing tier. The Options menu has some high level choices about your data. Aggregate: by Day/Hour/Month. This only affects how your exported data is aggregated. Your on-screen total will always be the same. Cost Type: blended/unblended/list. This affects the cost type that will be displayed. Chart Type: area/bar/column/pie. This affects the chart type that will be displayed. Resource ID: allows you to filter your search to a specific Resource ID. Include Usage Quantity: creates an additional column in your results that displays the usage quantity for the grouping. This is most helpful when used when grouping by Resource ID or EC2 Instance ID. Include Zero Costs: includes any rows that have zero costs totals. 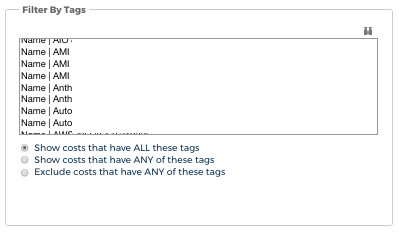 In this section, you have the ability to filter to specific sets of tags. Filtering will lessen your result totals because you are basing your selections only on the tags. In this section, you can select which exact items you want to search for. You have the option to use the default setting of having everything selected, or you can dig deeper and click in each section, selecting only the criteria which interest you. All of these categories and their entries are taken directly from the DBR. You will only be able to search for items that are present in your DBR; it will not be a search of every DBR item that AWS has ever created. Saved Filters are saved searches that you create which provide powerful functionality to automate and expedite your complicated searches. Ability to save the custom searches that you create. Ability to save time by continually updating your saved searches. When you search using Advanced Grouping, you are doing an ad-hoc query of the AWS DBR. If you have a complicated search with many groupings and tags, this could take some time, but after you create a saved filter, CloudCheckr will constantly update your search for you in the background so that it will return nearly immediately in the future, even if you search for a large date range. 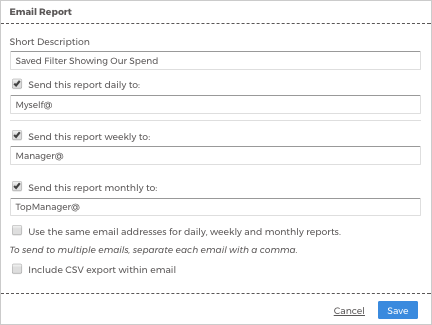 Ability to automatically send an email report and/or CSV update with your saved filter results on a daily/weekly/monthly basis. To create a saved filter, simply run your custom search and then click the Saved Filter button. You'll be taken to a menu where you can type a name for your filter and select any email options. Don't worry, you can change your email options at any time. When you create a saved filter, the advantage of quicker results will not be immediately available because CloudCheckr needs to build the entire historical search as a background process. You can enable the checkbox that says Send email on saved filter build completion to be notified when your saved filter is ready. Additionally, CloudCheckr will show you a warning message while your filter is being built. Once the message is gone, your filter is complete. A good example of the flexibility of Advanced Grouping is when you begin to do searches based on tags, looking across multiple accounts. This is a frequent use case for people who do chargebacks or need to report on many business units within an enterprise. Once you have a tagging policy in place, you can really take advantage of it by creating insightful, automated reports. In our example, we will look across an account, but we will start with a Grouping of Tag Key: aws:createdBy. Our next groupings will be Account and Service. The other main selections we have made are to choose Cost Type: Unblended so that we can see what each account actually used (stripping away any AWS blending of like charges), and of course selecting a Start and End Date. Our expected result is to see our costs grouped by aws:createdBy (which would tell us who the user is), and then by Account (where they used a resource), ending with Service (giving us a high-level view of what they are doing). You can add additional groupings to have as much detail as you'd like. Credits: Advanced Grouping is designed to show you all your actual costs. Therefore, it does not display credits because those are often applied to your account in various ways and after-the-fact. We have designed this report to show your true, raw total, from which any sort of calculations can be made moving forward. Comparing Advanced Grouping to your AWS Invoice: It can be confusing at first to compare your Advance Grouping results to AWS Invoice. This is because the AWS Invoice is in Blended cost, while within CloudCheckr you have the option to display any cost type (Blended/Unblended/List). Additionally, the Invoice may not show Marketplace charges and may show various AWS credits (though not separate credit memos). User chooses whether or not to display AWS Credits. Does display AWS Marketplace charges. 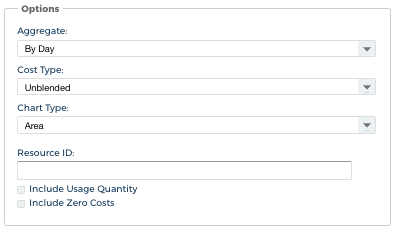 When in the payer account, displays costs for the entire Consolidated Billing Family.